Seriously, HERMIT CRABS FORM ORDERLY QUEUES. In height order. To more efficiently trade shells. I, for one, welcome our new crustacean bureaucrats. This is a segment from BBC's Life Story, and it captures some pretty extraordinary animal behavior. When a new shell washes up on shore, these hermit crabs measure each other and then line up from biggest to smallest until a crab that's the right size for the new shell comes along. 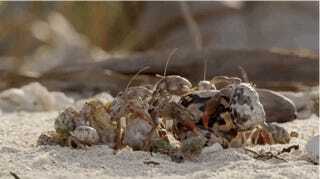 Then the crabs pass their old shells down the line and grab a new, slightly larger one. That way, each hermit crab in the line finds its new home with little hassle.